"Let slip the wolves of vengeance." Strippers vs. Werewolves gets off on the right foot not only because its title promises naked girls, but also because those gals apparently will not be facing off against goddamn vampires or zombies. Sure, werewolves might be in the dugout of overexposed horror icons from the past decade, but they’re way down on the bench compared to their undead counterparts. It’s also nice to come across a movie that’s decent enough to alert you that it shouldn’t be taken seriously the second you read the title, even if it’s not completely convinced of that fact itself at times. These two factions have been engaged in a mortal deadlock since at least 1984, when a Jeanette’s (Sarah Douglas) strip joint went up in flames. A quarter-century later, she’s got a new brothel of dancers that’s patronized by a werewolf. Since she’s not used to seeing lecherous old guys turn into wolves, Justice (Adele Silver) rightfully freaks out during a patron’s transformation and kills him by stabbing him in the eye with a pen. When his companions catch wind at his demise at the hands of a stripper, they’re none too pleased, so pack leader Ferris (Billy Murray) organizes payback against Justice and her stripping gal pals. Well, there are no shortage of the characters offered by the title; in fact, there are so many of the former that the movie can’t decide which girl to focus in on, so it’s a scatterbrained affair that bounces around a lot (hey, not unlike their breasts, I guess). Justice feels like the main character, if only because Silver plays her with a pouty sternness that indicates this is serious business. She also has the juiciest drama of the bunch since she’s hiding the true nature of her job from her fiancé (Martin Compson), who thinks she’s a veterinarian. When it turns out that he’s also part of the pack of werewolves trying to kill her friends, things even out a little bit. Other assorted drama involves a romance between one of the girls and the club’s soft-hearted bouncer, while another one has a thing going with an occult enthusiast who hunts vampires (damnit!) on the side. Talk about a relationship of convenience. With so much going on, you might expect Strippers vs. Werewolves to move at a breakneck speed, but it manages to be pretty lethargic. Set to the thudding beats of the constantly humming electronic score, the film plods along and never gets quite dialed in with the proper pace or tone. There are humorous bits (such as when a stripper describes her profession as being “like Santa Claus, only more naked”) and it mostly treads lightly, but it often feels pretty damn serious for a movie called Strippers vs. Werewolves. And this would be fine if it could stick to one mode or the other, but it’s constantly bouncing between obviously jocular segments and more serious ones, so it spins its wheels a bit. An inability to drum up much empathy for any of the characters simply results in one waiting for the inevitable final showdown at the strip joint, which finally embraces the camp aspect of the premise and even features a running tally of the causalities suffered on each side. Director Jonathan Glendering throws in other tics--like a copious amount of split-screen--in an attempt to bring a sense of style to an otherwise dull film that quickly degenerates into standard hack and slash nonsense. 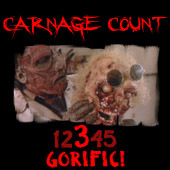 At least a lot of the gore is practical in spite of the comic-bookish approach the film sometimes takes, but I think there’s only so many times one can watch mediocre movies of this sort and only delight in the gore. In some ways, it reminded me of another recent Brit-horror in Dead Cert, and there’s apparently a reference to that film buried in this one somewhere, so that seems appropriate. Billy Murray stars in both, but he’s surrounded by a more impressive set here since Sarah Douglas is around in another thankless role, which has been the case for most of her post-Superman II career. Glendering’s biggest trump card comes about mid-way, when Robert Englund makes a cameo appearance; of course, the brief nature of his turn doesn’t keep his name from being plastered all over the place. That he’s only in the film for one scene isn’t as disappointing as it sets up something that’s never paid off; in fact, his one scene could be completely excised without impacting the film, save for shortening its run-time (which might not be the worst idea). Anyway, Englund is of course the best thing about the movie--somehow, he manages to sound classy even when he’s talking about ripping a someone’s heart right out of their chest. Maybe the film wouldn’t even have been made without his name attached to it, so it has that going for it--Strippers vs. Werewolves, perhaps against all odds, is a film that exists. Whether or not it’ll receive the follow-up promised at the end of this one remains to be seen, but it seems like this one thoroughly wears out the stripper gimmick enough. Released into theaters in its native UK earlier this year, Strippers vs. Werewolves is coming to Region 1 DVD and Blu-ray later this month courtesy of Well Go USA, where it’s graced with a fine presentation that highlights its sleek production values. The disc’s bonus features include a commentary with producers Jonathan Sothscott and Simon Phillips, plus a behind-the-scenes look at the film. Like so many films of this nature, the joke’s right there in the title for Strippers vs. Werewolves, and it ends up being as inventive and as obvious as you’d expect a movie to be when its opening credits are scored by “Hungry Like the Wolf.” Rent it!